There is a wide choice of holiday accommodation provided at the park. From families to couples to groups, you will find something that suits, whether it be for a couple of days or a couple of weeks. We take pride in our quality, self contained accommodation. The accommodation is modern, spacious, comfortable, full size kitchens, outdoor decks or covered verandahs. Kids will love the bunk beds. Man’s best friend will be very comfortable in a dedicated dog friendly cabin. Dogs are not allowed in any other accommodation including waterfront cottages, cabins and studios. 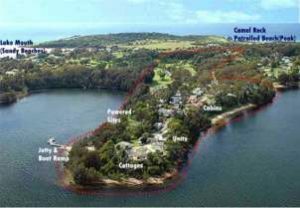 The majority of the accommodation is set along the point overlooking the water and provide breathtaking views across the Wallaga Lake to the mountains of the national parks.